NOVO7 £65 Android 4.0 tablet breaks cover in China | What Hi-Fi? Our sister site Stuff.tv is reporting that this NOVO7 Android 4.0 tablet has popped up in China for the remarkably cheap price of $99 (£65). 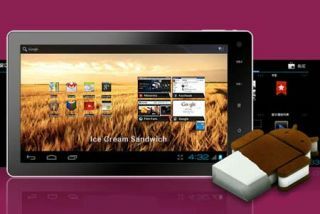 It's said to be the first tablet in the world to sport Android's latest operating system, Ice Cream Sandwich, and has a 1GHz MIPS processor. The 7in wi-fi device comes with 4GB of memory, and this can be expanded to 32GB with a MicroSD card. There are two cameras, front and back, and the claimed battery life is 30 hours. There's no mention of the screen resolution just yet, nor when it will ship. And if you did decide to buy one, the £60 shipping fee will bump up the price.